Gazing at a roomful of animal-lovers hoping to learn how to do more with less, Dr. Kate Hurley of the University of California, Davis, Koret Shelter Medicine Program worried that her words were falling on deaf ears when she looked at Tracy Mohr, the director of a municipal shelter with more than three decades of work in the animal welfare community. "She asked hard questions, one after the other," the shelter medicine pioneer said. "If I had to pick one person I didn't think I was getting through to, I'd guess it was her." Dr. Hurley now says she couldn't be happier that her impression was wrong. Mohr's questions weren't meant to tear apart the presentation; rather, Mohr explains, she was trying to understand what seemed to be too good to be true: that by refusing to take healthy cats into a municipal shelter, she could provide a better quality of service to those she serves in the Northern California college community of Chico - and she could do so while saving both lives and money. "We have a very active animal welfare community here, with a lot of organizations and a lot of very active, concerned people," says Mohr. "Our humane society here brought Dr. Hurley up, and we all went and listened. I had been doing research on the idea of not taking in healthy cats, but I didn't quite get it until I heard Dr. Hurley. And then it clicked. I was like, ‘Oh, that makes perfectly good sense.'" It made so much sense to Mohr that as of February 1st of this year, the City of Chico's municipal shelter no longer accepts healthy cats. People who need to rehome a cat are directed to the non-profit Butte Humane Society, which had long taken cats from the city shelter. For feral cat colonies, the goal is trap-neuter-release unless the animals are in a location that's causing problems either for the animals or people. And the "stray cat" who just turns up one day? In Chico you'll be advised to ignore her: she'll be much more likely to find her way home from a backyard in her neighborhood than a cage in one of the shelters. But leaving healthy cats where they are unless they're in trouble or causing trouble runs counter to decades of common practice that says, in effect, the safest place for any loose animal is in a shelter. Mohr knew that wasn't so. In fact, being taken to a shelter means a high chance of death for a cat in many cities and towns. Untamed ferals have almost no chance at rehoming, and owned cats are very unlikely to be reunited with their owners. Mohr realized that Dr. Hurley was right: taking healthy cats in only to kill them - when they became ill or when space and time ran out - was applying solutions that worked for dogs without considering that the needs and lives of cats are very different indeed. For example, Dr. Hurley points out that landing in a shelter is a good thing if you're a dog. "People know when a dog is missing," she says. "And they know it right away. The dog was here, and now he's not. That's not true with cats. It's not uncommon for an owned cat to be missing for a while, and an owner won't start looking because the cat always came back before. Until the cat doesn't: 67% of lost cats are reunited with their owners simply by returning on their own. But only 2% of shelter cats are claimed by their owners." "With all our efforts in shelters to reunite cats with their owners, more commonly what we're doing is killing people's pets," said Dr. Hurley. With her long experience in sheltering, Mohr agreed that change meant dealing with the cat as a cat. Or at least not like a dog. Maybe more like...a raccoon, or a skunk. No one would ever suggest that there was enough money or man-hours to eradicate entire populations of wild species in urban areas. Instead, the strategy is to remove dangerous or nuisance animals and help wild animals in trouble. 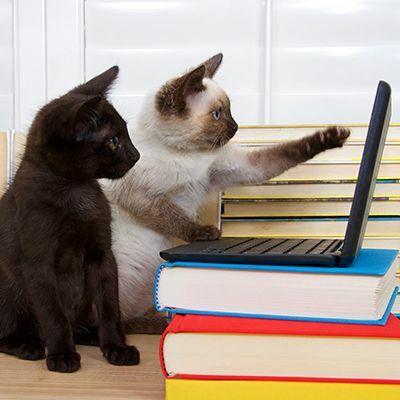 The same strategy works for cats, says Dr. Hurley, and Mohr agrees. "Take people complaining that there's a cat in their yard, going to the bathroom in their garden. If they trap that cat, really, is that going to solve the problem? No, because there are probably more cats in the neighborhood. Trapping will be an exercise in futility," said Mohr. "There are always going to be 15,000 cats in Chico, and we are not going to trap every one of those cats and eliminate them. What we're counseling people to do, the same way we counsel them with wildlife, is to use strategies that make a yard less attractive for a cat. Instead of saying, ‘Just trap it and we'll take it away,' they're being given the same message as when somebody calls whether it's a skunk or a cat. The problem gets solved by leaving the animal alone in most cases, and we're using our community to solve it." "And it helps that everyone's unified here," she said. "They can call the Humane Society, and they get the same message." Chico's cat policy is so new that any evaluation is probably premature; still, the numbers are going in the right direction, according to Mohr. "If you look at 2012, in February we had 60 cats come in, in March we had 99 cats and in April we had 147 cats come in. Then for this year, we had 15 cats come in February and 24 in March," she said, noting that April's numbers, while not yet complete, showed a similar drop. And while keeping healthy cats in place means keeping them alive, the policy change allows the shelter to have more resources to help cats who need it. "Six months ago I was thinking, gosh, do we need to get a portable classroom so we can get extra space? And now we're like, we have space," said Mohr. "When an animal comes in that needs help, the staff's not stressed, we have resources to care for them, and you know, it's just a whole different outlook. Instead of saying, ‘Oh my gosh, here's another box of kittens that somebody's going to dump on us,' it's more like, ‘Let's see what we can do to find a solution for your situation.'" The bottom line, says Mohr, is a collaborative effort aimed at problem-solving, using strategies that actually work with and for cats. Dr. Hurley points out the irony that it's often not the shelters with the most resources that institute real change, but those that are just looking for any way to cope with problems that seemingly have no solutions. "That's because the solutions never were solutions," she said. "When you take non-solutions off the table for whatever reason, new ways of doing things are often found."